In the context of immunity, Major Histocompatibility Complex (MHC) is an important molecule during the recognition of antigens (foreign substances). They are considered to be a set of cell surface proteins which basically function to bind with foreign antigens to present them on either of the T cell types; T helper cells (TH) or cytotoxic T cells (TC) through the T cell receptor. MHC class I and MHC class II are encoded by genes present in human leukocyte antigen (HLA) system. MHC molecules present on each cell surface display a particular fraction of a protein molecule called epitope. This prevents the cells immunity system from targeting its own cells during the presentation of antigens which can be either self or non-self antigens. MHC class I molecules present antigens on the co–receptor molecules known as CD8 which are situated on Tc cells, in contrast, MHC class II molecules present antigens on the co–receptor CD4 which are situated on TH cells. This is the key difference between MHC Class I and MHC class II. MHC Class I molecules are present on cell surfaces of all nucleated cells and are one of the main two classes of MHC molecules. These molecules don’t occur in red blood cells but are present in platelets. MHC Class I molecules detect protein fragments from nonself proteins within the cell. These protein fragments are known as antigens. Nonself antigens detected by MHC I molecules are situated on Tc cells. Tc cells possess coreceptor molecules, CD8. MHC I molecules which present antigens on CD8 receptors that will initiate an immunological response. Since the peptides present on MHC Class I molecules are derived from cytosolic proteins, the antigen presentation pathway of these molecules is referred as endogenous (cytosolic) pathway. MHC Class I molecules are composed of two nonidentical chains, long alpha chain, and one short beta chain. 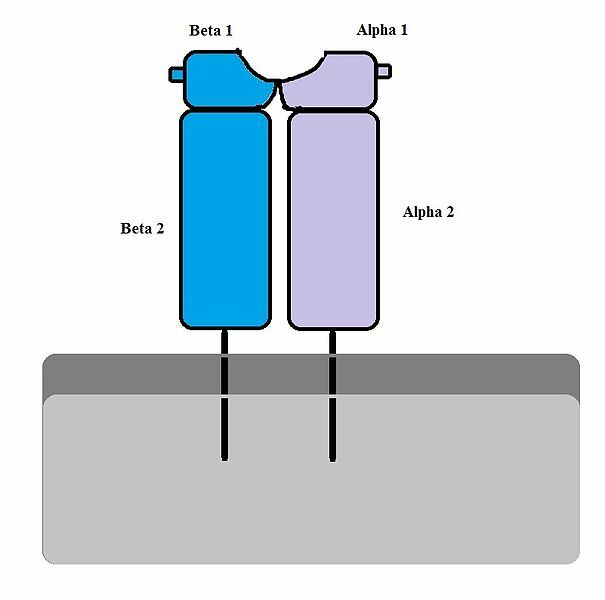 They are encoded by human leukocyte antigen genes (HLA) HLA-A, HLA-B, and HLA-C. Alpha chain is coded on the locus of MHC in chromosome 6 and beta chain is encoded on chromosome 15. MHC I molecules function as a messenger in displaying intracellular proteins to Tc cells to prevent immunological responses directed upon host’s own cells. When intracellular proteins degrade by the proteasome, peptide particles bind to MHC I molecules. These peptide particles are known as epitopes. The MHC Class I protein complex is presented into the external plasma membrane of the cell via the endoplasmic reticulum. Afterwards, the epitopes get bound on extracellular surfaces of MHC I molecules. Due to this process, Tc cells will not be activated in response to self-antigens. This is known as T cell tolerance (Central and peripheral tolerance). MHC Class I proteins are capable of presenting exogenous antigens derived from various pathogens. This is known as cross-presentation. During such conditions, when a foreign antigen is presented on Tc cells by MHC I molecules, immunological responses will be initiated. MHC Class II molecules are expressed by a specialized type of cells known as antigen presenting cells (APC). APC include macrophages, B cells, and dendritic cells. 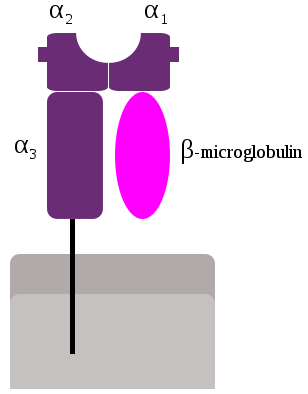 When an MHC Class II molecule encounters an antigen, it takes up the antigen into the cell, processes it, and then a fraction of a molecule of the antigen (epitope) is presented on the surface of MHC Class II. The peptide particles are derived from phagocytosis where the extracellular proteins are endocytosed and digested by lysosomes. The digested peptide particles are loaded into the MHC Class II before they migrate onto the surface of the cell. The epitope presented on the cell surface could recognize and bind complementary particles known as paratope. A paratope could be a self or nonself antigen. MHC Class II molecules possess two identical alpha and beta chains, which are encoded by MHC locus of chromosome 6. These molecules are encoded by the gene HLA-D. MHC Class II molecules present antigens to other cells of the immune system to initiate an immunological response with the help of TH cells. TH cells possess a co-receptor known as CD4. With the involvement of CD4 and T cell receptor, MHC Class II molecules activate the T cell and create an immunological response. The main function of MHC Class II molecules is to clear exogenous antigens present within the cell. What are the Similarities Between MHC I and II? Both molecules are synthesized in the rough endoplasmic reticulum. Both MHC I and MHC II are encoded by genes present in HLA location. Both molecules are present on the surface of APC. Expression of genes in both molecules is co-dominant. What is the Difference Between MHC I and II? MHC I is one of the two primary classes of Major Histocompatibility Complex (MHC) molecules and are found on the cell surface of all nucleated cells. MHC II is a class of Major Histocompatibility Complex (MHC) molecules normally found only on antigen-presenting cells such as dendric cells, some endothelial cells,thymic epithelial cells, and B cells. The MHC I molecule is composed of two nonidentical chains; long alpha chain and one short beta chain. MHC II molecule is composed of alpha and beta chains which are roughly identical. MHC I are found on the cell surfaces of all nucleated cells. MHC II is found in antigen presenting cells (APC) which includes B cells, macrophages, and dendritic cells. MHC I interacts mainly with cytotoxic T cells (Tc). MHC II interacts with T helper cells (Th). MHC I is encoded by genes HLA-A, HLA-B and HLA-C. MHC II is encoded by HLA-D.
MHC I involves in the clearance of endogenous antigens. MHC II involves in the clearance of exogenous antigens. MHC molecules are mainly of two types, Class I and Class II. They are considered to be a set of cell surface proteins which basically function to bind with foreign antigens that are deriving from invading pathogens. Later, MHC molecules present these antigens on either of the T cell types; T helper cells (TH) or cytotoxic T cells (TC) through the T cell receptor. MHC class I molecules are present on the cell surfaces of all nucleated cells and MHC Class II molecules present in antigen presenting cells (APC) which includes B cells, macrophages, and dendritic cells. Both molecules are synthesized in the rough endoplasmic reticulum and MHC I and MHC II are encoded by genes present in HLA location. This can be described as the difference between MHC I and MHC II.